The next recruitment campaign for exchange students, coming for the 1st Semester (September 2019-February 2020) or the full academic year (September 2019-June 2020) is now open! Your mobility project must be approved and confirmed by your home university. You must send your complete application file in due time. Language requirements: level B1 (according to the CEFR) in French is strongly recommended (Europass). When you have completed your selection, download it in PDF and enclose it with your application form. 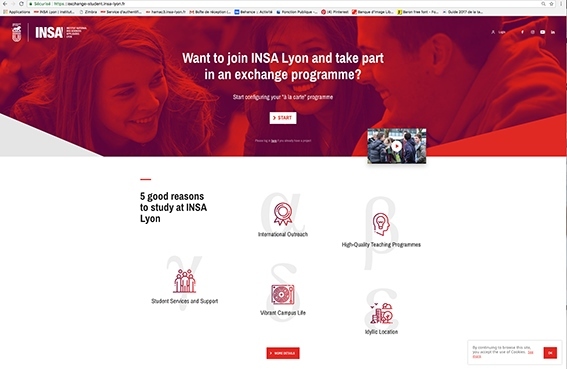 Finally, send your complete application file by e-mail to your INSA Lyon contact according to your geographic area (check contact on the left-side of this page). Please constitute a single PDF-file. Applications that are incomplete or sent after the deadline will not be considered. The selection committee gathers after the recruitment campaign to review the applications. For exchange students coming in the second half of the academic year (February-June 2020), the application period is scheduled from September 9th to October 20th 2019. The application form will be available on this page on September 9th 2019.